Recently, a reader of this blog* made some suggestions. His primary one--a black cherry soda which is rumored to have non-Euclidean taste properties--still eludes me, although there is a chance that I will be able to find it at the Galco's Institute of Weird Soda Research later this month. However, he also mentioned a birch beer and sarsaparilla made by Sioux City, and I did locate the sarsaparilla at BevMo the other day. I've always been a bit confused by sarsaparilla. First, the spelling. I've always heard it pronounced as "sasparilla", and yet it seems to be spelled with an "r". Perhaps it's like "February". Does anyone actually pronounce it "Feb-roo-airy?" On the other hand, perhaps The "Sasparilla" pronunciation is incorrect, or at least a dialect-based corruption of the original. Perhaps it really should be pronounced "Sar-sa-pa-rilla". However, that makes it sound like someone trying to pronounce "Salsa" with their mouth full of beans, in which case (since, given that it involves salsa and beans, it is likely a Mexican food) the double l should be pronounced as an English "y", making the correct pronunciation "Salsa-pariya". I think that's how I'l pronounce it from now on, and I'll inform everyone else that they're saying it incorrectly. Being pedantic is so much fun, especially when you're wrong. But in any case, the other thing which confuses me about sarsaparilla is what, exactly, it is supposed to be. The Sioux City bottle label proclaims it to be "The Granddaddy Of All Root Beer". The image reinforces this, depicting a mustachioed cowboy moseying between batwing saloon doors. The positions of his hands and wrists, though, make him seem somewhat effeminate. Which seems appropriate, if he's going up to the rough-and-tumble saloon/brothel bar, laying his pistol down on the counter, and ordering sarsaparilla. Well, pardner, time to saddle up and quaff off into the sunset. Color: Pretty standard dark brown, like root beer. Scent: like a light, sweet root beer. Lacks the sharpness of most root beers. K-i-C: "I like it. Very...earthy." Taste: A little more tart than the smell. Much like a root beer, a bit lighter than most, with some citric tang. Some spiciness. The initial taste has an interesting, very slight--almost undetectable--tinge of clay-ish taste to it. Pleasant. I like it a bit more than most root beer--but it is, effectively, a root beer. There is a slight hint of the mint taste I associate with birch beer, so maybe sarsaparilla is somewhere between the two. K-i-C: "It has that cure-for-stomach-ailments thing about it." Apparently, this is a more or less neutral comment. Quaff rating: 3.5. Nice, enjoyable. Cough rating: 0.5. That mint is just a bit off-putting, but not bad. *Cameron, in case you want to know. Thanks, Cameron! I've been doing some acquisition lately, keeping my thumb on the pulse of Weirdness, my eyes peeled for that unusual label on a high shelf. The donation of the Chin Chin Grass Jelly horror has galvanized me into seeking out more good stuff. Unfortunately, I haven't found anything to even come close to matching that can of insanity, but I've got some of the somewhat less-common brands in line for a quaffing. Yesyerday, I went to the fridge, meaning to assess our current holdings and make a few decisions. There, in the door of the fridge, was a bright yellow bottle of Jones Pineapple Cream soda. I don't remember buying it. The Kibbitzer-in-Chief assures me that she didn't buy it. It wasn't there the other day. "My dear," quoth I, "unto us the gods have given a soda." "That can't be good," quoth she. I am assuming that the Mysterious Stranger has not taken to sneaking into my house at night and planting soda in my fridge. It may be that, as I perused the aisles of a shop somewhere, this soda crept into my cart unbeknownst to me on insect-like legs which now lie hidden, drawn up beneath the exoskeleton-like label. Or perhaps I bought it, but my memory has been modified by nefarious aliens or Men in Black. Or maybe I am a seriously absent-minded doofus. In any case, today we're trying some Jones Pineapple Cream (or, as the label helpfully translates, Jones Crema de Piña). Where and when: Probably purchased July 2009, but I honestly can't remember doing so, or where it came from. Color: bright yellow, with a hint of green. Very similar to fluorescent highlighter. Scent: Piña colada-ish. Ever so slightly bitter, but 98% sweet. Taste: The pineapple taste is fairly accurate, reminiscent of very ripe fresh pineapple, but without the tartness. Very sweet, like most of the Jones line. The cream is a pleasant, not-particularly-vanilla cream, light. Tastes like coconut or bubble gum. This is, effectively, a pretty good piña colada soda. The cream takes dominance a few seconds after the initial taste, and then just kind of sits there. I feel no unexplained impulses to drink more, or to go out and buy more. I'm keeping a close eye on the fridge from now on, though. Quaff rating: 3.0. Pleasant enough. Cough rating: 0.5, stickily sweet. There were several things which made it such a wonderful day. The first (and most important) was that it was my thirteenth wedding anniversary. In case it wasn't immediately obvious, I am married to the Kibbitzer-in-Chief. She is the dearest love of my life, and I am passionately devoted to her. Even though she doesn't like soda. We had a nice day down in Balboa Park with the rest of the Lab staff, visiting museums and having a nice lunch at the Japanese garden tea pavilion. And yes, even there I had a Weird soda. "Gettin' Cool Melon Soda" was a treat. I have another can here in the Lab, and will review it soon enough. That visit to Balboa Park was the second good thing. The third good thing happened when we got back. In our absence, the postal service had delivered a couple of packages to the Lab. One was addressed to the Kibbitzer-in-Chief, and contained a single hollow triangular wood and plastic block. That's another story, and if she ever starts her own blog entitled "Weird Customer Service Experiences Review", you'll hear all about it. The other was for me--addressed to the Quaffmaster (well, actually, to the "Guaffmaster", but I'm assuming it was for me). I didn't recognize the name on the return label. However, since it wasn't from the Biotta company, I figured the chances of it being a bomb were pretty small, so I went ahead and opened it. Inside was--exquisitely packaged--a Weird Soda. I cannot tell you how thrilled I was to receive this. I experienced a moment of Buddha-like connection to all of existence (I call this "actualizing my Soda-nature", or "achieving Sodatori"). Someone out there not only read the blog, but actually sent me Weird Soda. I (and I am not making this up) almost wept with joy. It was sent by Paint CHiPs, a most noble personage with whom I am acquainted, and whose writing is among my literary role models. Beneath this is a picture of a glass goblet filled with a semi-gelatinous black curdled mass, with a straw sticking out of it. And a golden honeybee hovering nearby. Let me quote the Lead Assistant Reviewer's impression upon examining the can: "So you're drinking mud?" ...is made by boiling the aged and slightly oxidized stalks and leaves of Mesona chinensis (member of the mint family) with potassium carbonate for several hours with a little starch and then cooling the liquid to a jelly-like consistency. This jelly can be cut into cubes or other forms, and then mixed with syrup to produce a drink or dessert thought to have cooling (yin) properties, which makes it typically consumed during hot weather. The jelly itself has a slight bitter taste, a light iodine lavender flavor, and is a translucent black. It can also be mixed with soy milk to produce a milky white liquid with black strands in it. So I'm gonna get my yin on with the Chin Chin Grass Jelly Drink (Honey Flavour). But before I do (and keeping in mind that this may be my last chance to do so, given what this stuff looks like), allow me to express my most fervent thanks to the noble Paint CHiPs, who apparently (based on the included note) found this at a sidestreet bakery in Chinatown, in Chicago. Color: extremely dark brown, almost black. Not in chunks, or particularly jellylike. Scent: Sweet steel-belted radials. It actually does smell a bit like old rubber. Not very strongly scented. Slightly sweet, herbal, grasslike, muddy. K-i-C: (shrugs) "Smells like alfalfa tea." JAT: :Eww. Yuck. Yucky, yucky smell." K-i-C: "It smells like timothy hay. Or the doormat aisle at Cost Plus." Taste: The honey is strong and on top, and very prominent. There's a pretty complex set of tastes underneath that honey, though. Tastes a bit like chai. After the honey, there's a mild bitterness, with a moderate astringent/sour coming in shortly thereafter. The sweet/bitter and mild spiciness gives it the chai-like flavor. Aftertaste is dominated by the mild astringent, but it's not overwhelmingly sour; there's still a lot of honey in it. The K-i-C actually likes it. Rather a lot. As you drink it, and the layer of drink gets thinner, it becomes slightly more transparent. This is bad, because swirls of some sort of jellyish stuff start to become visible. K-i-C: "It's like the stuff you don't want to think about in the pond." The K-i-C takes another swig at this point. She is...unhappy with the results. I can't tell tyou how profoundly disturbing the sights of those half-hidden swirls of darkness are. It brings up serious deep-seated fears. Remember how you were sure there were monsters in your dark bedroom closet, and when you looked out of the corner of your eye, you could almost see them moving at the edge of the door? Now, as the layers of soda shrink in the glass, the surface begins to show texture, and the fragments of jelly can no longer remain obscured beneath the placid surface. It's like watching madness emerge from the placid exterior of that neighbor who was quiet and always kind of kept to himself. And streets of gold uncoveted. howled at the moon's sardonic face. The portal of each sepulchre! What nameless horror then befell. The nightmare lake may sink no more! Another swig--and this time little fragments of jelly manage to get into my mouth with the liquid. Unexpectedly. I feel violated. It's not that they taste bad--they have almost no taste at all. It's that they were uninvited. Bleh. I feel that it is my professional duty to compare this with the other gel-based Weird beverage we have reviewed, the Tsubutsubu Mikan Jelly. The gel in that was ubiquitous throughout the liquid, and gave the whole thing a gloppy texture. This stuff is separate--a black tea-like liquid, at the bottom of which lie distinct fragments of fairly firm jelly-like stuff. That was like quaffing a citrus shoggoth. This is like drinking tea in which a shoggoth has placed its larvae. So the taste isn't bad. Tea-like, reminscent of sweet chai, herbal. Not really to my taste, but the K-i-C says she likes it a lot. The actual experience of quaffing it, though, is mind-wrenchingly horrible enough to remind me of poetry written by H.P. Lovecraft. Aftertaste update: The longer it sits in my mouth, the stronger the astringency gets. Quaff rating: 2.5 for the taste. -3 for the texture. Let's say 1.5 overall. Cough rating: 1.0 for the taste. 2.5 for the texture. Again, maybe 1.5 overall. The Knudsen Spritzers are a common fixture in health food stores. They're in the Fruit domain on the Weird Soda Venn Diagram (see below, the blue star). The K-i-C has reminded me that, really, "vegetable" should not be a subset of "fruit"; if anything, it should be the other way around. She is, of course, correct. I'm not going to change it. Ha ha! In any case, we've generally avoided the Knudsen spritzers because they're unbelievably expensive. However, even with the recession and resultant budget cuts (can you believe that neither the California state government nor the federal government has allocated anything for Weird Soda research this year? ), we can afford this bit of expenditure. Perhaps we can aim for a bailout. 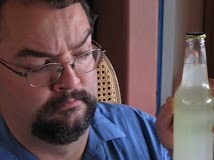 Weird Soda Review: Too Weird To Fail. So the Kibbitzer-in-Chief brought a sample of R.W. Knudsen Spritzer--specifically, the Orange-Passionfruit species--back to the lab for quaffing. Now, interestingly, I note that the can actually says there are four juices present in this particular concoction. Let's check...yep. Apple and grape juices come before orange and passionfruit. Ah well. Color: a mostly opaque yellow-orange. Not as opaque as orange juice, but more so than most lemonades. Scent: Citrusy. Orange and passionfruit are definitely present, but it's more bitter than I expected. Maybe grapefruit? The Lead Assistant Tester says he smells mango. I think it's just the passionfruit. Taste: Fairly strong and tart. I actually coughed a bit, but not because it's disgusting. Definitely orange and passionfruit. I can taste the mango more now. The Junior Assistant Tester says it tastes like pear, while the Kibbitzer-in-Chief votes for papaya, mango, and orange. I still think there's some grapefruit. Apparently, Knudsen is a many-splendored thing. The LAT: "Tastes like Orangina at first." It's nice enough, but not remarkable. JAT: "It's hard to explain." For notes on the meaning of this cryptic phrase, see this review, under "Scent". The aftertaste is pretty similar to sour orange. Cough rating: 1. It would get a 0.5 for the taste, but I have to give it a 1 because I actually coughed. One of Lovecraft's most famous stories--and it's a long one, out to novella-length--is At the Mountains of Madness. It's a stirring, adjective-laden tale of a doomed expedition to an ancient, prehistoric city in Antarctica, the discovery of the preserved antediluvian inhabitants, and the eventual death and/or insanity of the vast majority of the expedition members. You know--a Lovecraft story. The inhabitants of the city end up being known as "Elder Things". They're sentient part-plant creatures who came to Earth billions of years ago. When I found "Elderflower Soda", that story came to mind. It probably says something about me that the term "Elderflower" makes me think less of idyllic sylvan or pastoral settings, and more of eldritch tentacled horrors from outer space. In any case, when I found "Elderflower" soda at Galco's, I had to get some. We've previously reviewed Sweet Blossom Soda's herbal offerings--see their Rose Petal review--and found them nice and pleasant, but a bit odd. I don't know whether Elderflower is more likely to make a good soda than rose petals, but such speculations are not in the purview of a Quaffmaster. Whether it's good or not is not the issue; it's only whether it's Weird. The Kibbitzer-in-Chief reminds me that in the classic movie "Arsenic and Old Lace", the nice old ladies poisoned people with elderberry wine. I presume that elderberries derive from elder flowers. Perhaps they are derived from Elder Things. Color: very pale beige, with a yellow tint. Scent: Hmm. Pearlike; quite sweet, fruity, yet not cloying. A nice smell. Very little tart in it. Taste: Very nice, quite a surprise. Floral and fruity, cool. The taste is also very pearlike, with just a bit more acidity than the smell, but not even going so far as tart. Tastes a bit like the smell of roses or tulips. The aftertaste is somewhat similar to that of the french-vanilla type of vanilla cream soda; a bit of acid and a creamy vanilla note, although this is more fruity. If I were to imagine a pear cream soda, it might taste like this. Given that pears are my favorite fruit and cream sodas are among my favorite sodas, this is emphatically a good thing. While the Lead Assistant Tester is attending a robotics seminar today, the rest of the Lab staff and visitors Long Rod McBean and Punctilius all like it. They all comment on the pear, vanilla, and floral notes with approval. Good stuff. Highly recommended. Burp. Tekeli-li! Quaff rating: 4. Really nice! Cough rating: 0. Nothing to object to. The Obscure Soda Lovers Organization Wants You! In our eternal quest for soda Weirdness, we here at the Lab have always known that there were others who shared our calling. Witness, for example, the fine work of the good (and long-suffering) gentleman at Soft Drink Reviews! However, it was only recently that we were contacted by representatives of a mysterious and powerful organization of soda afficionados (whose mystery is exceeded only by their power). The Obscure Soda Lovers Organization (or OSLO) has set up a website to present information, reviews, and resources to all of us on the quest. We at the Weird Soda Review Testing Lab salute these brave pioneers, and would like to encourage all seekers after soda Weirdness to visit them and make your own contributions. You'll find them here. Go forth and quaff heartily! This morning, the Kibbitzer-in-Chief spotted an interesting article in her online local news. Apparently, a Jack-In-The-Box here in Vista (for those who might not know it, Jack-In-The-Box is a fast food burger chain) is pioneering a new self-serve Coca-Cola soda fountain. "But wait!" you say. "We already have perfectly good self-serve soda fountains. Why, at the fast-food burger chain most proximate to my abode, I can dispense a cup of fizzy soda goodness into my own cup with dispatch--with joyful abandon, even. Not only that, but I can even mix sodas, producing bizarre and fantastical hybrids. Weird Sodas of my own devising! What say you to THAT, so-called Quaffmaster?" Well, first let me say that I admire your ability to dispense sodas with joyful abandon. I, too, enjoy self-serve unlimited-free-refill soda dispensers, and I, too, feel the need to escape from the six or seven varieties of soda with which one is usually presented at such appliances by combining them in unnatural ways. When the Weirdest thing one can reasonably hope for is Pibb Xtra, one must create one's own Weirdness. This new contraption, though, is supposed to provide increased personal choice in soda. It claims to be able to dispense over 100 different soda flavors. Well, that sounds like a job for the Quaffmaster if ever I heard one. So this morning, after giving RoTalMomska a ride to the airport, I zipped over to the JITB to investigate this new bit of soda dispensing technology. And there it was, over in the corner. Rounded curves. It looked, honestly, a bit like a top-and-bottom clothes washer and dryer with a touchscreen. I moseyed (yes, moseyed) over. In front of the machine, with furrowed brows, were a couple of gentlemen. I looked over their shoulders and noticed that they were investigating the Fanta options. "Peach Fanta. There's one I hadn't heard of before," I said. They turned. "Thank the Lords of Carbonation you're here, Quaffmaster!" they exclaimed. Well, okay, they didn't. Actually, they just sort of looked at me. If they recognized me as the Quaffmaster, they didn't show it. Perhaps they had been expecting me, knowing that such a device must soon attract my attention. "It's kind of stupid, but kind of cool," said the one with a blond ponytail and beard. That sounded right up my alley. After they obtained their peach Fanta and departed, I had a chance to look over the device. The touchscreen presented a variety of beverage logos, from Coke to Sprite to Fanta to Barq's. So far, while it was a decent set of non-Weird sodas it wasn't anything special. I touched "Coke"...and was presented with a submenu of options. Cherry Coke. Lemon Coke. Vanilla Coke. Orange Coke. Raspberry Coke. Hmmm...that's a bit more interesting. Sprite produced a similar set of options, as did Fanta. It appeared that what we had here was a device which could add a variety of fruit syrups to various standard sodas, producing soda flavors which were...well...slightly less standard. Weirdoid? Weirdesque? Weird-adjacent? Still, a little Weird in your soda is far better than no Weird at all. I decided to start with a raspberry Coke, made the appropriate selection, placed my cup in the obvious receptacle, and hit the big button which was labeled "Dump". Okay, not "Dump". I don't remember what it was. "Dispense", probably. A small amount of soda was dispensed to my cup, but it stopped as soon as I let go of the button. Ah! Here was a possibility. The ability to do combinations exponentially increases the available Weirdness. Now we can explore the possibility of raspberry-peach-lime Barq'sa-Cola. That's pretty Weird! Apparently, the flavor options for Barq's are...Barq's. No Raspberry. No lime. Not even vanilla. If, as I strongly suspect, this doohickey just adds syrup to soda bases, why would you cut off the truly Weird options? Was there some sort of soulless focus group somewhere which felt that someone might seek weird Barq's, and not like it, and they would be forever scarred? Curses! Curse you! CURSE YOU, SODA CONTRAPTION FOCUS GROUP! Club soda is just club soda. Alas, the only Weirdness the Coca-Cola company is willing to tolerate is the anemic semi-Weirdness on which their approval is laid. While this device does permit one a tip-of-the-tongue experience with Weirdness, it isn't the real thing. And Coke is SUPPOSED TO BE THE REAL THING! I have to hope that somewhere on this machine there is a secret option for truly classic Coke. Not "Coke Classic"...I mean the ORIGINAL recipe. Another acceptable option would be a specific tack in advertising. Something along the lines of "With the new Coca-Cola Dispensing Machine of the Future, you don't need a soda jerk. You can be your own jerk!" Ah, well. Disappointment is all part of the quest for Weird Sodas. And I have to admit...I kind of grooved on Raspberry Coke. I just hate to see opportunities wasted. I've been intrigued by the offerings of the Dry Soda Company. So far as I have been able to tell, their sodas consist of lightly sweetened carbonated water with essential oils from whatever flavor they are claiming to be. It's quite a bit more delicate than most sodas, Weird or otherwise, but that can be an interesting and refreshing change. We've reviewed their kumquat, rhubarb, lemongrass, lavender, and vanilla bean flavors so far (the vanilla bean was especially nice). Now comes number six: Juniper Berry. I'm a Weird Soda specialist. I don't drink a lot of alcohol. It's not that I don't like an occasional glass of wine or beer, it's just that it wouldn't usually be my choice. I have almost no experience with any harder liquors. It's my understanding that gin is made from juniper berries, so this may well taste like gin. I won't know. Tonight, the lab staff is entertaining a visitor, who goes by the handle RoTalMomska. Of all of us, she is the only one who is familiar with the taste of gin. This should not be interpreted as a covert statement that RoTalMomska is extensively familiar with gin. She is, as we speak, standing upright with no trace of slur in her speech. I have never, to my knowledge, seen her intoxicated, and I've known her for some time. In any case, she will be able to provide verification of any kinship between Dry Soda Juniper Berry and gin. Wait, she just suggested we go get some gin. Perhaps I need to rethink the previous paragraph. I'm having a hard time imagining what gin tastes like. I'm having a mental taste image of alcoholic pine-scented floor polish, but I must assume that if it really tasted like that, people wouldn't drink it. I have always assumed that people wouldn't drink things--even alcoholic things--which didn't taste good. The other day, I had a small taste of Jagermeister. I have, myself, tasted two yogurt sodas and Biotta digestive drink. Now I know. People will drink ANYTHING. Color: completely clear. No pine needles or berries are evident. Scent: Pine-scented floor polish. Quite light, though, not strong. RoTalMomska (takes a single, small sniff): "Gin." This comes suspiciously quickly and confidently. RoTalMomska and the Kibbitzer-in-Chief are debating the scents of gin and vermouth. RoTalMomska: "You put vermouth in Manhattans." K-i-C: "I put vermouth in everything. I love vermouth." Taste: A bit sweeter than most Dry Sodas. A touch of oil, faint hint of pine-ish flavor, a tiny bit spicy. The aftertaste is very odd--sour and oily, heavy yet faint. A bit like pre-vomit saliva, yet not as nausea inducing as that would suggest. I ask our expert if it tastes like gin. RoTalMomska: "No, it doesn't taste like gin. If it's going to smell like gin, I'd just as soon it taste like gin." K-i-C: "No, it tastes like lavender eau du toilette." Junior Assistant Tester: "It's very very bubbly." This isn't all that dissimilar from their vanilla bean, except it's a bit moresour/acid and has a less pleasant aftertaste. I would find this less refreshing than their other offerings. So there we have it. It smells a bit like gin, but doesn't taste like it. Quaff rating: 2.0. It's not that it's unpleasant--it's kind of nice. But not very nice. Cough rating: 1.0. The sour aftertaste is icky, and it's kind of oily. In high school, a dear friend once dubbed me "Captain Obvious" based on my ability to comment on things which were completely obvious to other people (Superhero catchphrase: "Up, up, and away, because I can fly!") She made me a t-shirt, cape, and everything. Needless to say, my superhero weakness (which was closely related to my power, as any good weakness should be) was to be completely oblivious to things which were immediately obvious to everyone else. Two sharp-eyed readers of this blog* (who are also good friends) have pointed out something which I should probably--it being one of my superpowers and all--have noticed. To wit: our domain name can also be read as "Weird, So Dare View!" or, with a transposal of two letters, "Weirdos Dare View". So all four of you who read this blog: you, too, are now officially Weird! I don't know if there is any significance to this, but it's comforting to know that my own personal Kryptonite is still working well. *Emily Eakes and Linley Heath. Yay Emily and Linley! Thanks. While on my Mitsuwa pilgrimage, as I perused the shelves populated by exotic varieties of Ramune and melon cream sodas, my interest was caught by something which seemed out of place. The Japanese characters which covered most of the beverages had begun to merge into a finely woven carpet of Nipponese incomprehensibility, with kawaii anime-style characters popping out like wide-eyed overly cute tulips from a mossy bed. Suddenly, though, a series of recognizable letters emerged, but arranged in a suspiciously French manner. I paused. Staring back at me, with a supercilious gleam in its hypothetical eyes, was a bottle of "Fauchon Paris Le Cafe Juicy Surprise!" In addition to this French/English chimeric label mutant, further information on the bottle was in Japanese characters. A trilingual Weird Soda! This was most excellent. In an effort to synthesize these three linguistic groups into a coherent soda-based image, my imagination concocted a small round table. The legs and rim are wrought iron, baroquely curved. The top is a mosaic of cracked tiles. Sitting at the table, beneath an umbrella which normally shades the patrons of this sidewalk cafe at the corner of the Rue Jules Verne and a nameless alley from the overly-warm sunshine but which today provides shelter from the hints of rain from the lowering clouds, is a man. We shall call him Pierre. Pierre is reading a battered paperback copy of Albert Camus. His bicycle is leaning casually against the crumbling brick wall of the cafe. Before him is an ashtray (unused today) and a bottle of Juicy Surprise! Pierre lays down his paperback, glances pensively at the sky, sips his Juicy Surprise, and returns to slurping up his large bowl of shoyu ramen. From the speakers of the cafe, we hear the theme to Science Ninja Team Gatchaman, arranged for violin and accordion. He's wearing a Green Bay Packers T-shirt. We need something to explain the English. Needless to say, I had to buy the Juicy Surprise! True, it's not carbonated, but I'd say it's Weird, and that's what matters. It's tea based; the ingredients list features water, sugar, black tea, lemon juice, and "flavor". As to the nature of the Juicy Surprise, I am put in mind of the liquid-filled styles of gum, or perhaps jelly doughnuts. Those don't seem applicable here. Perhaps the unnamed flavor is the Surprise? Other than the French in the name, there is nothing on here to indicate the role that France played in the creation of this beverage. The Kibbitzer-in-Chief speaks a tiny bit of French, and she thinks that "faucher" means "to mow (as in a lawn) or harvest", while "faucon" means "falcon". Okay, now Pierre looks up from his Camus and ramen. There's a disturbance down the street: screams and the sound of running feet. A crowd surges toward the cafe, fleeing from something. As they pass him, Pierre glimpses a flock of falcons sweeping down from the sky, scythe blades grafted to their wingtips. Harvest time has come to Paris. Okay, that's probably not what "Fauchon Paris Le Cafe" means. If it is, I don't want to think about the Juicy Surprise. For now, let's assume it refers instead to the bountiful harvest of citrus fruit which supplies the unknown "flavor", as well as the Juicy Surprise. Color: light amber, slightly grey. The Junior Assistant Taster says "Yellow". Scent: Tea-like, with strong lemon scent. Smells kind of a lot like the sweetened Nestea Lemon flavor which comes in cartons. The JAT says "It's hard to explain," but he also says that whenever asked why his room hasn't been cleaned, why he's not in bed yet, or how the living-room floor came to be covered with a uniform 2-inch-thick stratum of Legos. Taste: Not carbonated. Less lemony than the scent would suggest. The tea is clearly present. Not particularly strong, somewhat sweet. The lemon is only strong in the very last aftertaste, which has a faint tartness, strengthening over time. Similar to Nestea carton, but less sweet and less citrusy. JAT: "Ends with kind of a watery taste". Lead Assistant Tester: "Slightly bad. Refreshing, but not good." Kibbitzer-in-Chief: "Surprise! It's a very expensive Snapple." Quaff rating: 3. Pleassnt, and as the LAT says, refreshing. The bitter in the tea is kind of yucky, and the sweet tastes synthetic. UPDATE! A good friend of the Weird Soda Review lab staff, who is wiser in the ways of international epicurean exploits than we are, informs us that Fauchon Paris is, in fact, a luxury food store. (Visit their website here). However, they don't seem to list Juicy Surprise! on their web site. Perhaps it would spoil the Surprise. "Well, Quaffmaster? And how dost thou like adventuring?" "Oh, it's marvelous, your grace. But it's peculiar..."
"To me, this grape-tasting soda looks exactly like an orange soda, such as I have had with Taco Bell." "Well, like beauty, my friend, 'tis all in the eye of the beholder. Only wait, thou shalt quaff amazing things!" "Cucumbers and cherries, colas and chocolate egg cream, a cavalcade of bottled Weirdness as far as the eye can see." "Ah, they are dangerous. But one there will be to lead them, and he shall be most dangerous of all." "The great Biotta. Beware him, Quaffmaster, for his scent is foul and his spirit fouler. He is a scourge upon all which is quaffable. But one day we shall meet!" And that's how I came to be who I am today. Or something like that. Back in my early days as Quaffmaster, I received a Weird soda called "Looks Like Orange, Tastes Like Grape". While I did not provide a review, I have a dim memory that it did, indeed, look like orange. As to what it tasted like, I can't vouch for that. You see, the Mysterious Stranger doesnt seem to take summer vacation. In my campus mailbox, I found yet another marvelous gift; a fresh bottle of Looks Like Orange, Tastes Like Grape. At last, I can redeem myself for my failure to review it before. I do have a slight fear that the review will end with "Looks Like Orange, Tastes Like Crap", but we'll see. Color: Well, I guess I have to say it. It...looks like Orange. Slightly cloudy, fairly rich red-orange. Scent: Interesting. Definitely grape-ish, quite sweet. Slight hint of bubble gum. Taste: Doesn't exactly taste like grape. Sweet, light, and cool. Grape-esque, berryish. As the foretaste dissipates, a moderately tart aftertaste comes up; orangelike. A nice taste. Less acid than most other graoe sodas. This is more like actual Concord grape juice, with extra sweetener. The sugar is recognizably cane sugar, rather than corn syrup. A pleasant surprise, really. Quaff rating: 3.5. Pleasant but unremarkable. Cough rating: 0.5. Not much to object to. *I have a nearly obsessive affection for Man of La Mancha, by Dale Wasserman, Joe Darion and Mitch Leigh. This comes from that.